No matter if it is a small office network or a large enterprise, todays networks require the ability to connect numerous computer and other devices to your network and have them be able to access the internet. Due to the dwindling number of available public IP address there needs to be a way to translate these inside private addressed devices to a shared pool of outside public addresses. This is called Network Address Translation (NAT). The (DHCP) is an automatic configuration protocol used on IP networks. Computers that are connected to non-DHCP equipped IP networks must be configured before they can communicate with other computers on the network. DHCP allows a computer to be configured automatically, eliminating the need for intervention by a network administrator. It also provides a central database for keeping track of computers that have been connected to the network. This prevents two computers from accidentally being configured with the same IP address. 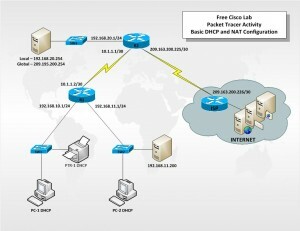 In this lab, you will configure the DHCP and NAT IP services. One router is the DHCP server. The other router forwards DHCP requests to the server. You will also configure both static and dynamic NAT configurations, including NAT overload. When you have completed the configurations, verify the connectivity between the inside and outside addresses. Configure a Cisco IOS DHCP server. Configure dynamic NAT with a pool of addresses.